As mentioned in my Skousen CAFÉ article this week, a recent debate about whether to give taxpayer-funded universal income to all Americans showed two social Democrats opposing the idea, even though they normally are associated with the “left,” and Charles Murray, a libertarian who often is viewed as someone on the “right,“ favoring it. This just goes to show you how outdated and misleading left and right political labels are, and why they should be discouraged if not eliminated from civil discourse. They are divisive and create more heat than light. Such labels often also are used to smear people. It should be all about what is right, not who is right. The debate should be on the issues, not putting people in political boxes to demonize them like they do in the media (New York Times, Fox News, etc.). When you label someone, thinking stops and finger pointing begins. At FreedomFest, we discourage speakers and attendees frobm using these schismatic “left-right” labels. We need to avoid prejudging speakers as much as possible and listen to what they have to say. The problem with labeling people “left” and “right” is that you imply an equality. In economics, for example, Adam Smith and his laissez-faire policies are viewed as “extreme right” on the political spectrum and Karl Marx and Totalitarian Communism as the “extreme left.” The Aristotelian middle is John Maynard Keynes and Big Government/Welfare State. But is that the ideal? I prefer the Totem Pole approach, where Adam Smith is at the top, Keynes is in the middle, and low man on the totem pole is Marx. 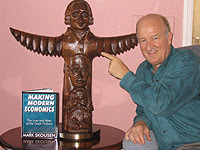 See the accompanying Totem Pole in Economics that I commissioned several years ago.